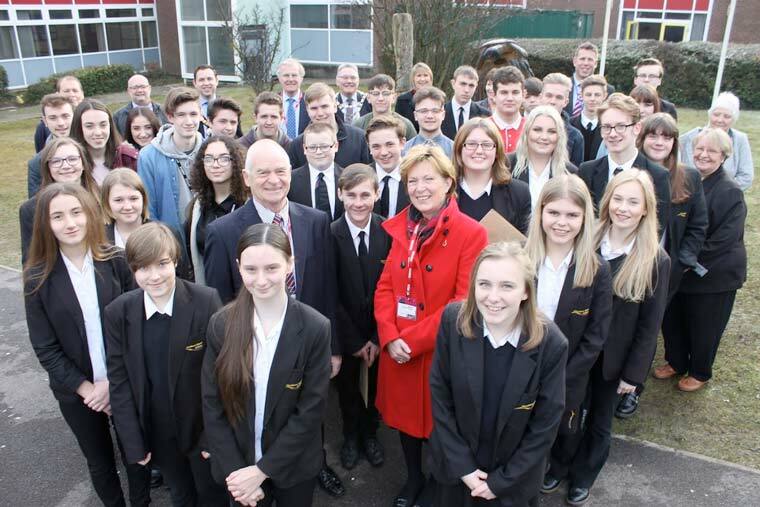 Thanks to the local charity John Thornton Young Achievers Foundation (JTYAF), 46 outstanding young people from Ferndown Upper School are closer to achieving their ambitions. A group of outstanding young people from Ferndown Upper School were presented with scholarships and bursaries from JTYAF on 6 February to help develop their talents. Seven scholarships were awarded to students to support them in a range of activities from volunteering expeditions to Thailand and Kenya, to helping with the purchase of musical instruments. An extremely talented young man is also a step closer to achieving his ambition of becoming a professional golfer. A group of 18 students received a contribution towards their volunteering trip to Africa and another 21 bursaries were presented which included badminton coaching and equipment for a county player, competition entry fees and licences for a top ranking cyclist, archery equipment, a diving course, photography equipment, and lap tops to support students with additional needs. The JTYAF was set up in memory of 22-year-old Lt John Thornton RM from Ferndown who was tragically killed in southern Afghanistan in 2008. The charity announced last month that it had allocated £85,000 for awards to young people in 2017. For more information about the work of the JTYAF please visit www.jtyaf.org.